In the latest issue of the Journal of Pharmaceutical Sciences, researchers document the potential of the new drug delivery system. Using a pig as a model, the team demonstrated that injection into the intestines is an effective method of insulin-delivery. 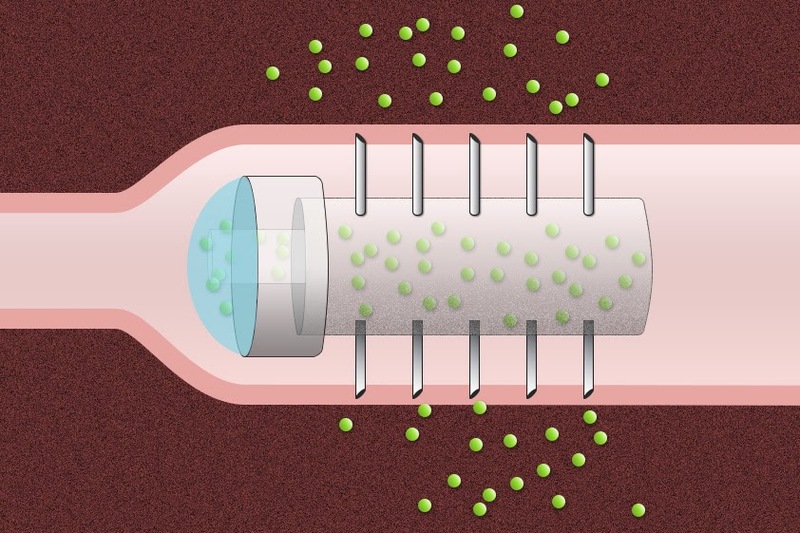 In a second experiment, the team showed that a pill measuring two centimeters long, 1 centimeter across, and coated in five-millimeter stainless-steel needles could pass safely through the digestive tract of a pig. The concept for the pill starts with a capsule being coated with tiny needles, then a pH-sensitive coating. The coating not only makes it possible to swallow the pill, it also dissolves away in the low-pH environment of the stomach. When it does, the needles are exposed. Intestinal contractions carry the pill through the digestive tract while applying pressure to an internal drug reservoir. In this way, the drug is delivered via the needles into the intestinal wall, where it can be absorbed. Such a system could one day replace injections of medications like insulin, which are too big to be absorbed via the stomach, and prone to decomposition by gastrointestinal molecules, to be taken orally. Future versions of the pill could be coated with needles made of degradable polymers and sugars.